The sports fields of Jack R. Hammett Sports Complex showed an impressive reduction in salts and chloride and an increase in water holding capacity after a product containing SumaGrow&REG; was applied. Less than three months after being treated, the soil pH decreased to a healthier level and the chloride and salinity levels dropped 26 percent and 34 percent. Equally remarkable was the increased soil moisture or quantity of water contained in the soil, from 63 percent to 69 percent. The trial above was conducted by Royal Barenbrug Group. It is the largest privately owned grass seed company in the world and develops products for the turf industry including golf fairways and greens, sports turf, and professional landscapes and residential lawns. 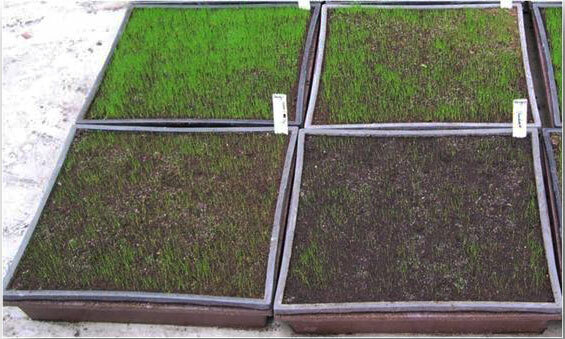 They compared seeds treated with SumaGrow&REG; against a control on Bent Grass. The seeds were coated prior to planting (SumaGrow&REG; treated trays on the left and control trays on the right). 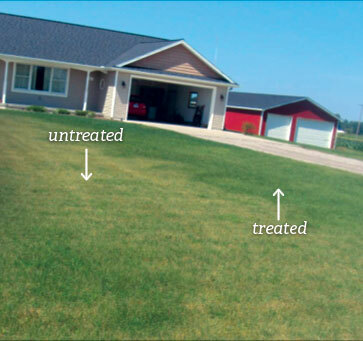 Bob Groulx applied SumaGroulx, SumaGrow&REG; Inside product on his neighbor’s yard, but only one of his sprayers was functioning. You can see the distinct difference between the portion that received Bio Soil’s product and the portion that did not. This photo is from a Texas sod farm. The customer used a product containing SumaGrow&REG; on a section to see how well it well it worked on grass. 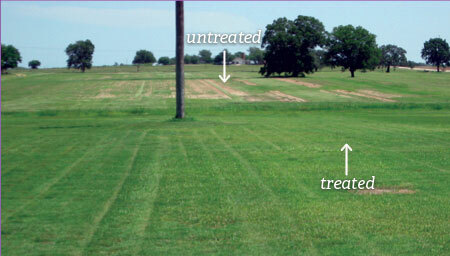 As the picture shows, the section treated with a product containing SumaGrow&REG; had remarkably faster and healthier growth than the untreated section. The football field in Salem, IL, achieved 95 percent grow in, in eight remarkable weeks compared to the average grow in time of 16–18 weeks, using only SumaGrow&REG; based products. 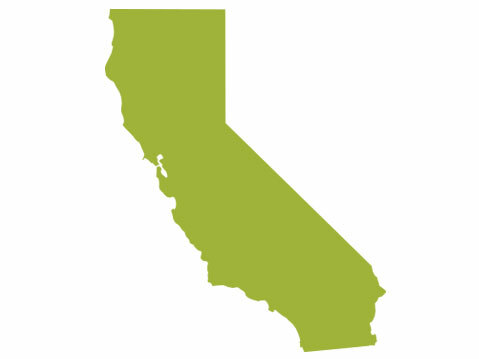 Professional landscaper and agronomist, Dave Bartok, and his brother Danny, have been in the landscaping business for over twenty years and manage over 7000 accounts, 3000 using solely SumaGrow&REG;. As the field was being converted from cool season grass to warm season grass, the treatment began by killing off the existing cool season fescue and blue grass. After core‑aerating the field, the field was treated with one gallon per acre of a product containing SumaGrow&REG; and then power seeded with around 100 lbs of Bermuda Grass seed. Three weeks later Dave applied another application of one gallon per acre mixed with 1/2 the normal application of post ‑emergent weed control. The standard second application of weed control was cancelled as the grass was so thick there were no weeds. There was 100 percent reduction in fertilizer, 16.7 percent less seed, 75 percent less weed control products, and no more than half the normal growth time! “Normally I am very conservative and cautious, but this product has shown tremendous results and saved my company a lot of money,” Dave said. As Director of Parks and Recreation for the City of Hattiesburg, I can say unequivocally that ReeCourse Golf ’s turf products (containing SumaGrow&REG; inside) manufactured by Bio Soil Enhancers, Inc. have done an excellent job in refurbishing our soil and providing healthy growth for our hybrid Bermuda grass. Two years ago we visited with Chuck Grantham, a former Mississippi State Extension Agent for Forrest County, and was encouraged by him to try these products on our soccer fields where we were having serious weed problems and where our hybrid Bermuda grass had areas of very stunted, patchy growth. We are now in our second full year of using ReeCourse Golf’s turf products (containing SumaGrow&REG; inside) on all eighteen of our soccer fields. 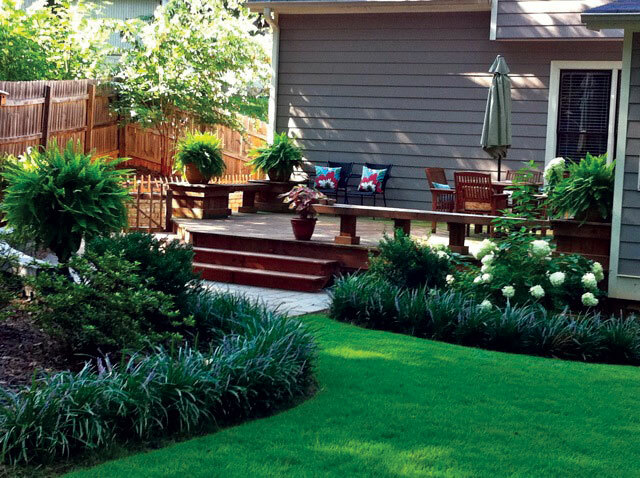 Our fields are beautiful with luscious growth and we have saved time and money on fertilizers and pesticides. I would highly recommend the use of these products to anyone.